One of the early articles written about the Guidebook was by Geoff Gilliard. In 2003, he described how the work of two local governments had provided case study content for the Guidebook. The contribution by the Regional District of Nanaimo (RDN) is described below. “For most of the last century, land development in our communities has followed the same general pattern: clear the trees, put in roads and subdivisions, and direct the runoff into the nearest stream or storm sewer. But pipes carrying runoff speed the flow of stormwater, often creating erosion and downstream flooding,” wrote Geoff Gilliard in an article published in Spring 2003. The RDN was the demonstration region for applying a Knowledge-Based Approach and testing a methodology for prioritizing action that focuses on low-cost results by getting the right people together in working sessions. 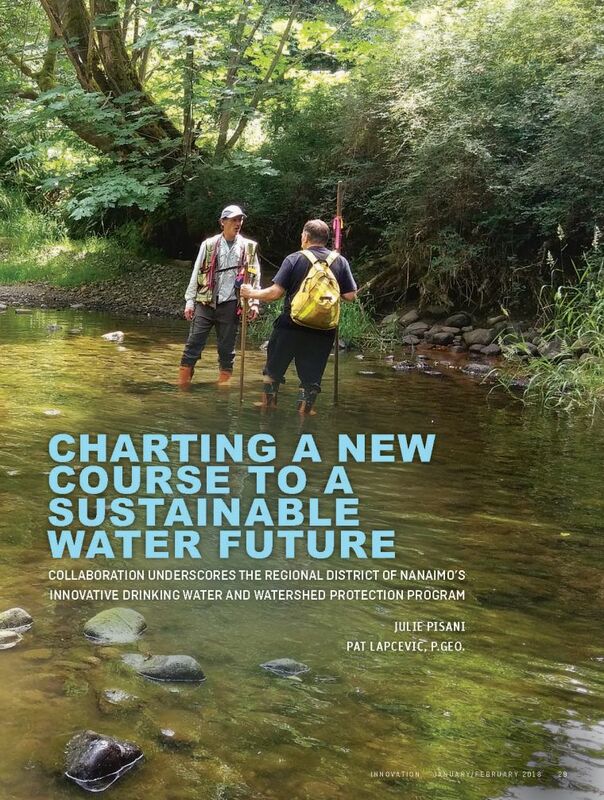 “The most effective and affordable way to identify at-risk watersheds for priority action is to tap the knowledge of people within any regional district or municipality who have the necessary planning, ecology and engineering knowledge,” stated John Finnie in 2002. In his capacity as General Manager of Environmental Services for the RDN, he led the RDN process and was a member of the Stormwater Guidebook Steering Committee. 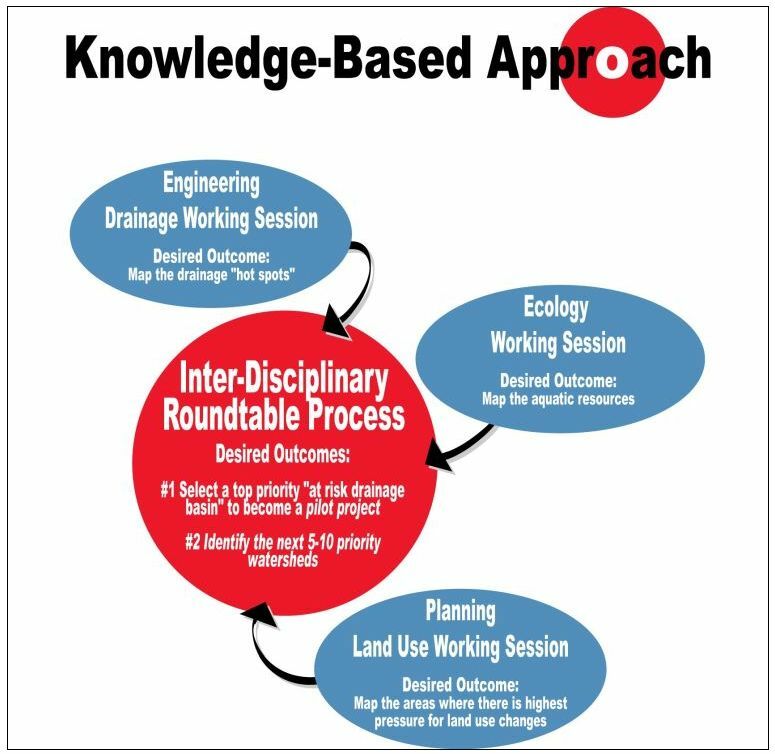 “The knowledge-based mapping products from three focused working sessions (land use, ecology and engineering) fed into an interdisciplinary roundtable. This roundtable is where representatives from the three focused working sessions overlaid key information on future land use, aquatic resources and drainage problems to identify at-risk drainage catchments and prioritize action. “If the right people with the right knowledge are involved at the start, a knowledge-based approach will be both time-efficient and cost-effective,” continued John Finnie. “In February 2003, a staff report to the Board crystallized the Action for Water vision,” recalled John Finnie in the RDN section of Beyond the Guidebook 2015. “The 2003 report is a valuable historical document, and built on what the RDN had initiated through participation in the Guidebook development process. Not only did it consolidate various directives, it identified a strategy (and associated implications) for moving forward incrementally with the regional service area for the Drinking Water & Watershed Protection Program. “In 2008, and as the outcome of a successful referendum, the RDN became the first regional government to create a drinking water and watershed protection service area with taxation authority in an electoral area. This was the culmination of a 6-year effort. In 2012, the service area was expanded to include the municipalities within the regional district and they became active participants in the watershed function. To read the entire document, download Stormwater Planning: A Guidebook for British Columbia.